Feeds 101: Using RSS to Follow the Lincoln Lagers! But what does RSS have to do with my homebrewed beer? You can add the RSS Feed for our website into your favorite Reader, or even into your cool-looking iGoogle homepage if you like! 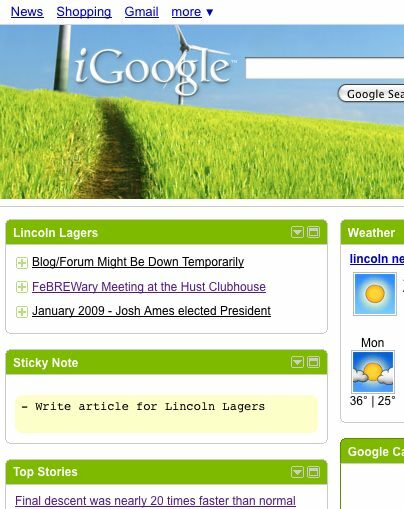 As you can see, you can compile all sorts of useful information onto an iGoogle page, including the Lincoln weather, news, sports updates, a cool sticky note pad, and the latest news from LincolnLagers.com! If you want to add a Lincoln Lagers feed to your own reader or iGoogle page, you just need our feed link! You can find it by scrolling all the way to the bottom of any LincolnLagers Blog page, or you can just click here.